After returning from Germany I've now had time to look at the contents more closely. 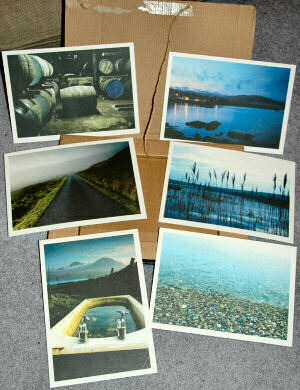 Turns out there were six very nice postcards from Bunnahabhain in it. They show impressions from around the distillery and Islay, the photos were taken by Alex Telfer. You can see some on his website, including this bathtub with a view to the Paps of Jura or this view of Bunnahabhain at last light. Not among the postcards, but I also like this view of Bunnahabhain pier with the Paps of Jura and the wreck of the Majestic. Use the search to find further images from Islay. Now I just need to decide who to send the postcards to. 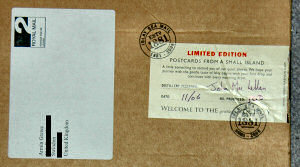 If you think you deserve to be sent a postcard from me let me know and I'll get writing (while supplies last). And a Thank You to Bunnahabhain for the cards!